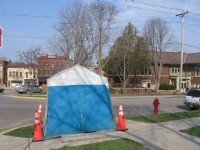 I saw this utility tent across from the library last week and opened the flap. Inside was Steve Poole, one of the employees of the the St. Olaf Telephone Company. (Photo is hazy because I took it through a screened window.) 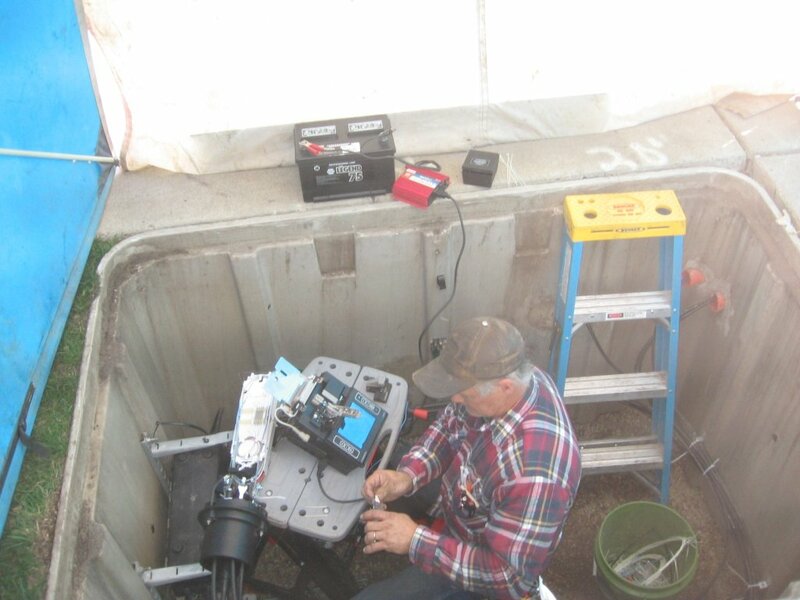 Steve was working on the colleges’ fiber optic cable that runs right down Washington St., from Carleton on its way to St. Olaf. He said the Internet2 connection to the library was ready to be lit. They were just waiting for TPTB to give the go-ahead. I asked him what he knew about Jaguar Communictions and their plans for FTTP as I’d heard a reliable rumor last week that homeowners in the Circle Lake area were being told that they’d be able to get fiber to their homes later this year. (Jaguar got a $4.6 million USDA Rural Development Loan last year to provide “…varying degrees of voice, data, and video broadband service to more than six thousand residential and business customers” in 8 southern MN counties, including Rice. More info here.) 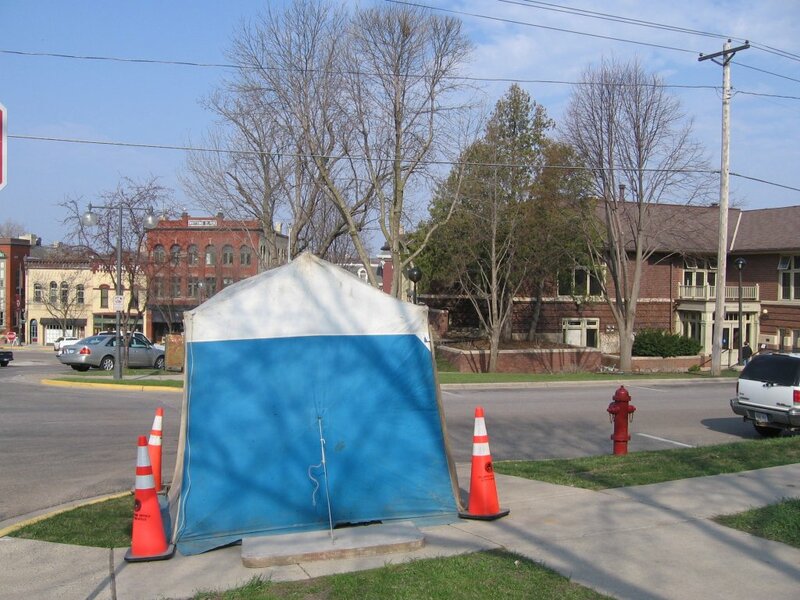 Steve said they’d be deploying it in both Dundas and Northfield soon but as far as he knew, it was strictly residential, whereas the St. Olaf Telephone Company was strictly business. Now what we need is a Northfield blog/web page/site to keep track of all the fiber and ultra high-speed broadband developments in the area. Anyone? Anyone? Anyone? Griff, you should talk to Craig Dunton. He probably knows all about it. St. Olaf Telephone will be hooking me up in the next day or two. They gave me a groovy pizza cutter for signing up. “anyone? anyone? anyone?” free book to the first person to name the actor who said that. Ben Stein, in Ferris Bueller. good call, stop by Monkey See, Monkey Read for your book. Wake up and smell the coffee, Mr. Benson. It’s a fool’s paradise. He is just leading you down the primrose path. I should be fiber ready by tomorrow. I asked how fast will this be? the reply was “How fast do you want it?” I said as long as it’s faster than anything Wigley’s got I’m cool. Thanks for unzipping that tent and doing some true investigative journalism, Griff! Fiber optic broadband would be a huge boon to the area. Coincidentally, I just got an email from Charter saying that my 3 megabytes per second Internet service had just been increased to 5 megabytes per second. So I infer that 5 mbps service is their new minimum service and that they will raise the price Feb. 1, 2008. Perhaps someone could confirm that. If they don’t raise the rate much, I’ll be OK with that. Anyways, it’s good news for now! Here’s a link to a with the information. Didn’t code that link very well. Here’s the Charter web page with the info. I’m getting their 10MB service (10 down, 1 up). Not too bad, but slower in the evenings. Hey guys, just get all your friends and associates to start lobbying your Ward and At-Large City Council reps to let them know WHY fiber-to-the-premises is important, why municipal participation is necessary and desirable (i.e., the industry economies of scale make it likely that Northfield will fall even further behind the technology curve); then maybe we can start building some political will instead of our current political won’t. I am still thinking the Charter pricepoint is too high for the 10 MB Service. We need more competition, so that the price drops. I think the last price I was quoted for 10 MB service was about $65 a month plus modem rental?